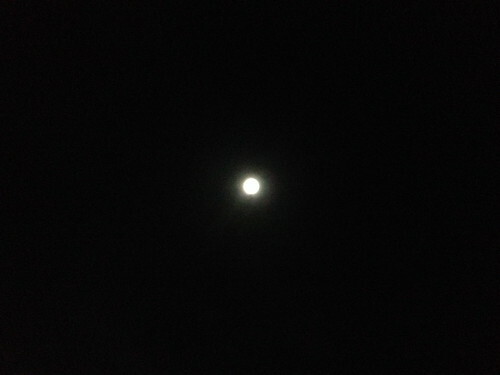 In case you missed it, there was a grand celestial event this past Friday night. 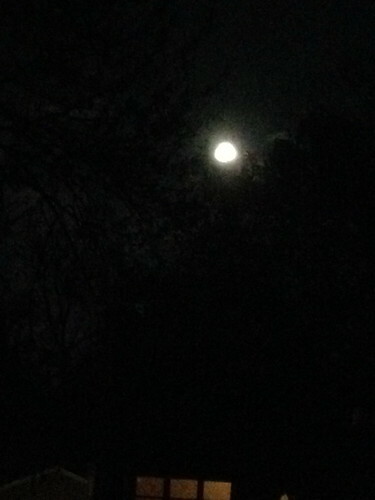 First of all, there was a luminous full moon. Then, there was a lunar eclipse. Finally, a comet, which looked green, was to pass through the night sky. I've mentioned how my dad was enamored with the night sky. He bought a telescope when we were kids and we looked at the moon, a lot, particularly in the summer. That was mainly because we complained about the cold, even though winter skies are clearer than summer skies. Because of his interest, evening skies and celestial events are still a great draw for me. This August, part of Illinois will get to experience a total solar eclipse. I thought about trying to drive south, but everyone and their brother will be down there. I'll be happy for the 90% we'll get up here. It makes very interesting shadows. The last time we experienced this, Carole was in 5th grade and her school had an eclipse party. We made pin hole cameras for all the classrooms. I do remember street lights coming on where the street was shady. The computer sits facing the east so I get a good view of the moon as it rises. On Friday, I thought the eclipse was to 'start' at 6:48 pm my time. The night was clear, which was, itself, wonderful because we'd had 3 weeks of near constant clouds. The moon rose and, well, nothing. In all the time I watched, I never saw any indication of a lunar eclipse. I was busy so I couldn't check astronomy web sites. The umbra color of the moon during an eclipse is always fascinating. I never saw anything green in the night sky either. Just the red and white lights of incoming aircraft headed to O'Hare airport. It was something of a let down. But, I was able to take photos, back in November of the Super Hunter's Moon. This is from November 12th. 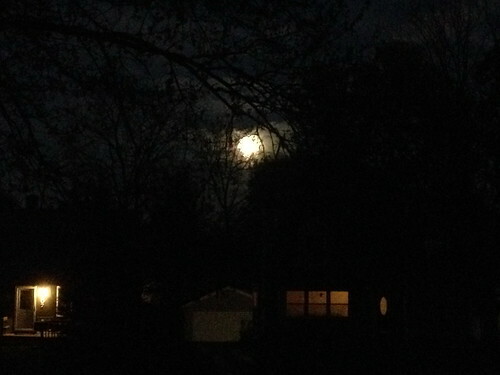 The actual Hunter's Moon was the 14th, but it was big and white on the 13th. Here it is, rising in the east. It usually takes a bit of time to go from a light yellow to full white, but the November moon seemed to start out white and just get brighter as the evening wore on. I remember it was nice out, so standing on the front steps trying to get decent photos of it wasn't an exercise in frozen fingers. You can see in the above photo that it's not quite 100%. Compare the above photo with one taken on the 14th at, roughly, the same time. It's always an adventure to take moon photos when the moon clears the tree line. 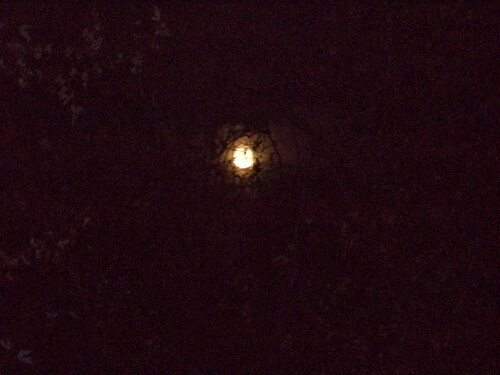 I often have to walk down the steps and get the moon in branches before backing up so there is only the white orb left. And, at times like this, I wish I had better equipment than a pocket digital camera or my phone, which is years old. We've had a lot of celestial "It won't happen again in your lifetime" events in the last 20 years. This is another one. It's exciting.